We are a community of learners, children, educators and families. Vera Lacaze is a place where individuality is celebrated, respected and cherished. We view every child as being exceptional in their own right and endeavour to provide a happy, harmonious environment in which a child can grow. The founder of Kindergarten (children's garden) Friedrich Froebel, stressed the respect with which the individuality and ability of each child should be treated (Gutek, G.L. 2001). We provide a protected, nurturing space where these differences are celebrated and where the individual can feel safe and thrive as their true selves, rather than being moulded in a pre-determined way. Returning families welcome new families and contribute to the warmth and consistency of or community. Visitors, artists, parent engagement (music, library, working bees, special interests and skills, different cultures and language experiences, supporting educators) adds to the success and joy of belonging to the Vera Lacaze Community. 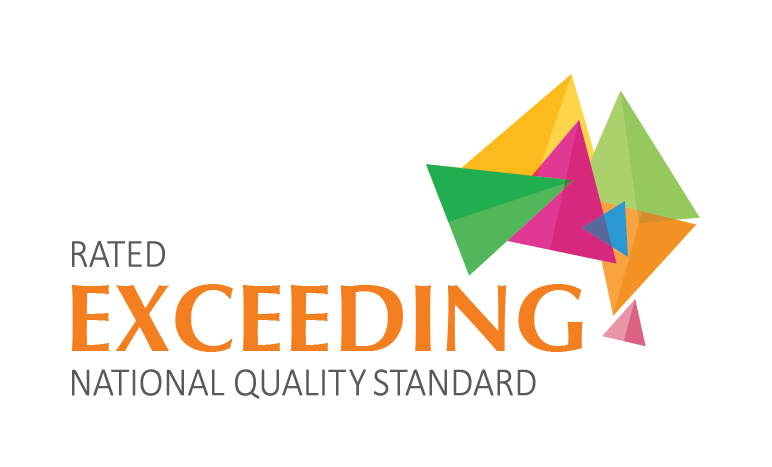 Assessed as EXCEEDING in all seven quality areas of the National Quality Standards. A huge variety of equipment, materials, resources and flexible routines to expand children’s choices, everyday interests and to ignite new interests. Well qualified and experienced staff ensure that planning is flexible and able to be woven into child-led projects. This ensures children’s learning is authentic and meaningful to each individual. Vera Lacaze Memorial Community Kindergarten offers an abundance of facilities to provide your child with the perfect environment to learn and grow. The Vera Lacaze Memorial Community Kindergarten is known for its playscape which offers a variety of different outlets for children to discover and learn. Facilities include traditional options such as our fort, sandpit or swings, as well as plenty of other interesting activities including the double decker bus, vegetable gardens, water play, and digging patch! There are also mountains of interactive activities including mobile, adaptable play equipment such as blocks and hoops. Our beautiful playground encourages scientific investigation of insects, plants and the extended natural environment. The Cassia Room is located at the northern end of the building and is embraced by our large Cassia tree and deck. Gorgeous sunlight floods the room in winter and the tree provides cooling shade in summer, with views to Newington Park through our large windows. The open and inviting space is designed to extend the learning environment onto our deck and then into our wonderful garden. The Callistemon Room is the first room that you come to on your way into our kindergarten setting. Our room has beautiful natural light that filters through large windows allowing children to look out onto our playground as they play and work. Callistemon trees have been planted outside the room to further attract the many species of birds which visit our playground. Our general facility areas include baby change areas and bathrooms (including disability access), as well as a variety of facilities for parents, visiting guest speakers and professionals, including a tea and coffee station, library and book exchange. The entire Kindergarten is air-conditioned for the comfort of children all year round with large windows allowing for fresh air and views to the beautiful outdoor areas.